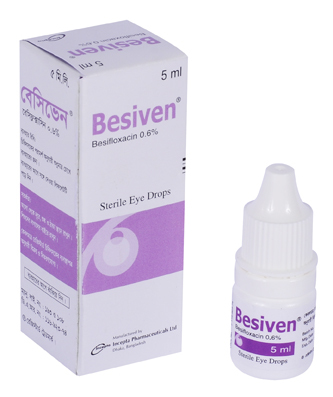 Besiven Sterile Eye Drops: Each ml contains Besifloxacin Hydrochloride INN 6.3 mg equivalent to Besifloxacin 6 mg.
Besifloxacin is an 8-chloro fluoroquinolone anti-infective for topical ophthalmic use. It has activity against both Gram-positive and Gram-negative bacteria due to the inhibition of both bacterial DNA Gyrase and Topoisomerase IV. CDC coryneform group G, Corynebacterium pseudodiphtheriticum, Corynebacterium striatum, Haemophilus influenza, Moraxella lacunata, Staphylococcus aureus, Staphylococcus epidermidis, Staphylococcus hominis, Staphylococcus lugdunensis, Streptococcus mitis group, Streptococcus oralis, Streptococcus pneumonia, Streptococcus salivarius. Adults and children (1 year of age and older): Instill one drop in the affected eye(s) 3 times a day for 7 days. The most frequently reported ocular adverse event was conjunctival redness, reported in approximately 2% of patients. Other adverse events reported in approximately 1-2% of patients included: blurred vision, eye pain, eye irritation, eye pruritus and headache. • This drug is for topical ophthalmic use only and should not be injected subconjunctivally, nor should it be introduced directly into the anterior chamber of the eye. • As with other anti-infectives, prolonged use may result in overgrowth of non-susceptible organisms, including fungi. If superinfection occurs, discontinue use and institute alternative therapy. • To prevent contamination do not touch the tip of the dropper to eye, eyelid or any surface of the affected eye. • Patients should not wear contact lenses during the course of therapy with this drug. No adequate and well-controlled studies are established in pregnant women. This drug should be used during pregnancy only if the potential benefit justifies the potential risk to the fetus. It is not known whether Besifloxacin is secreted in human milk or not. Caution should be exercised when Besifloxacin is administered to a nursing mother. The safety and effectiveness of Besifloxacin in infants below one year of age have not been established.